Install Patch on a rezzed piece of ice as a hosted condition counter with the text "Host ice has +2 strength." I have a feeling this card will get lots of "meh", because of the influence and for it having to take up a card slot, but not from me. True, I suspect this will stay for the most part in Weyland, but what can you bring in? Splashing for Lotus Field just got that much sweeter. Being able to put Architect out of Mimic range is some pretty serious business. Rototurret won't vaporize to Parasite and Enigma can finally get one over on Yog.0. All of this at 0 cost ...yeah...this card is not "meh"
Patch was a sleeper card on release, and one I almost never see played. But, I think like fine wine, its status has only improved with time, and it's one card that has definitely grown on me. What I love about it is its flexibility, and that it grants the corp unparalleled counterplay. Let's look at some popular runner cards to figure out why. The most obvious is Atman. On more than a few occasions, I've seen runners drop a lot of to get a big Atman capable of breaking my 7+ strength pieces of ice. Frequently combined with Net-Ready Eyes, it can give runners extreme efficiency, allowing them to perform multiple runs on a server with giant ice like Curtain Wall. Patch foils—or at least puts a wrench in—their plan. Short of reinstalling Atman (and paying even more credits on the next install), their only hope is boosting beyond what NRE alone can provide, e.g. with The Personal Touch or The Helpful AI. Gordian Blade, or similar ice that keeps its strength bonus throughout the run. Stacking ice, at least of the same type (or even different, if facing Paintbrush, Rielle "Kit" Peddler, etc. ), does almost nothing to slow the runner. They just need to boost to the strength of the strongest piece of ice encountered for the whole run, and then pay typically only 1 per . This lets you boost the biggest piece of ice, taxing them 2 per run. Sure, it's not as much as Tollbooth, but it costs a hell of a lot less to get the same effect. Yog.0/Mimic, or any other fixed-strength breaker. This is where the real jackpot lies. You almost always see some really big buffs, or several different debuffs used in conjunction with these, and Patch flies right in the face of what those are trying to accomplish. Making a runner drop an additional two sucker tokens per run is huge, and it can lock runners out entirely in some cases, like the case of a boosted Yog.0 vs Lotus Field. Finally, I have to mention Parasite specifically. Though not very popular, it is sometimes played without support from the strength-lowering Datasucker, e.g. with a Blackmailing Valencia. In these cases, Parasite is always played on my most costly to rez/break ice, which is usually Archer or similar. In these cases, it's a huge deal to have +2 strength on that ice, as it buys you two more turns before you need to purge virus counters (assuming you want to save the ice), and during these longer time windows, who knows what can happen; maybe the runner will bump into your Cyberdex Virus Suite, saving you a massive , or effectively a whole turn (aside from the mandatory draw). So why isn't this in every single deck? Well, there's a catch—it's in Weyland, and it costs 2 influence. 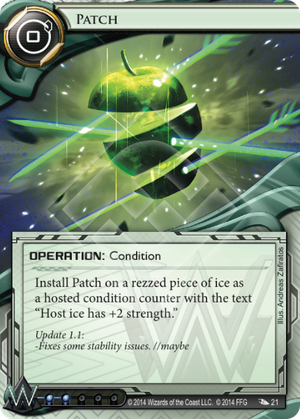 Weyland, the one corp with an undisputed monopoly on advanceable-for-strength ice, gets a card to, shockingly, do the equivalent of just that on other ice, albeit in a more limited fashion. Sadly, at two influence, it's really hard to justify exporting this into other factions. That said, I like to do just the reverse—import ice from other factions into my Weyland deck, and then drop Patch on them. Should you use this in faction? Yes, or at least, I do, and it's now a staple in my Weyland decks. Out of faction, it's a tougher sell. But, I still drop it in a deck when I've got faction to burn, usually Jinteki, where a few strength on a single piece of ice can be the difference between victory and defeat. So try it out, and remember to watch the runner's play like a hawk to get the maximum effect from Patch. Don't drop it prematurely either; it usually serves you best when played in a reactive capacity.